Critical Battery. Your Battery is Empty. To continue using your Kindle, connect to a power source. Empty Battery. Connect your Kindle to a power source and charge it until this screen disappears. Screen stuck at a screensaver. Message says “Slide and release the power switch to wake”. Nothing happens if you slide the power switch or even if you try to reset your Kindle. If you face on of the situations mentioned above, here are the steps to revive your Kindle. Plug the Kindle into the Kindle A/C adapter and let it charge for a few hours. Make sure that you plug your Kindle into the A/C adapter. Plugging your Kindle to a computer won’t give it enough power to wake it up irrespective of the number of hours you charge it. Make sure the charging light is lit — sometimes a drained Kindle will stop charging a few seconds after you plug it in. After a few hours, the charging light will change from yellow/orange to green. 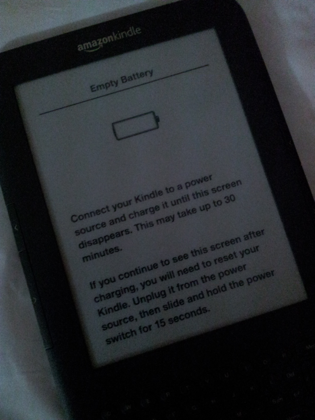 It means your Kindle has enough charge to behave normally. Following the above steps will most likely revive your Kindle. However, if above steps fail to revive your Kindle, you need to reset your Kindle. If you still see the same Critical Battery screen or Zero Battery screen or screensaver stuck at the same place – Unplug the USB cord, then hold the power slide to the right for at least 15 seconds. At the end of 15 seconds, you would be able to see the power light blink and Kindle will restart or get reset. Your Kindle should now be ready to use. If your Kindle is still stuck at the same Critical Battery screen or Zero Battery screen or screensaver stuck at the same place – Release the power slide, then immediately press and hold the Home key for another 30 – 45 seconds. If your Kindle will not turn on still – the battery might be too far gone. You will have to order a battery replacement at Amazon. You can improve Kindle battery by following some simple tricks.